Brisbane Heat vs Perth Scorchers Tonight at the Gabba!!! A Cricket Match Not to Be Missed! When you think of summer sports, cricket is usually the first one that comes to mind! 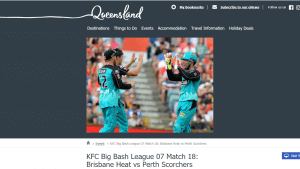 The Big Bash League is a quick, entertaining & colourful match to view of a night time! If you’re looking for something to do tonight, go check out our home team, Brisbane Heat play against the Perth Scorchers at the Gabba. Both these team are in the top 3 at the moment, so this will be a match worth watching! If you’re unable to go, then you can view it live on tv from the comfort of your living room. Event info can be found here. The team at Really Cheap Carpet Cleaning Brisbane hope you have a fantastic and safe weekend! https://www.reallycheapcarpetcleaning.com.au/wp-content/uploads/2018/01/Screenshot-2.png 746 1325 pippa https://www.reallycheapcarpetcleaning.com.au/wp-content/uploads/2017/05/Logo.png pippa2018-01-05 01:44:412018-01-05 01:44:41Brisbane Heat vs Perth Scorchers Tonight at the Gabba!! !